The IV Therapy Center of NYC located in Midtown East in Manhattan is a best in class award winning medical IV nutritional therapy practice spearheaded by our triple board certified medical doctor and nutritional IV drips specialist – Sue Decotiis, MD. We are the NYC destination for intravenous therapy, vitamin infusions, supplement IV infusions, as well as chelation therapy & detox therapy. A key advantage of IV therapy is that it allows for the 100% bioavailability (absorption) of fluids, minerals, and vitamins as they avoid being processed by the gut (which can result in decreased physiologic availability due to the digestive system), allowing for better cell absorption. IV therapy also assists in giving the body a boost at times of high stress, injury or illness and promoting general well-being. We offer the most comprehensive medical IV Therapy “cocktails” in NYC. Each and every IV therapy infusion is customized to the patient’s unique needs. Every IV Therapy infusion is customized to the unique needs of each patient. Even patient receives a complimentary consultation with our triple board certified doctor prior to infusion to ensure the best possible “cocktail” for your needs. Our infusions are isotonic, osmolar, magnetized, alkaline, manufactured in the USA and independently tested. simply put: we offer the strongest, safest, most effective IV vitamin, mineral, and supplement therapy in NYC. We mix all medical grade IV cocktails at the time of your visit, specifically for YOU. The IV Therapy Center of NYC specializes in an extensive range of IV therapy services ranging from our renowned intravenous vitamin infusions to other wellness treatments such as rejuvenation, anti-aging, weight-loss, and diagnostic therapy, all tailored to specific needs. Our IV nutritional therapy drip treatments are the most effective, natural, safe and essential method to support a healthy lifestyle. Your IV Therapy will start with a consultation with the board certified doctor so we understand exactly what you’re after and can customize a treatment to suit your unique needs. We aim to partner with you to achieve your unique goals including weight-loss, adrenal fatigue, anti-aging, chelation therapy to remove toxins or heavy metal, detox therapy, or to help to support general health and well-being. Our best in class top rated NYC doctor will prescribe the right kind of treatment for your individual needs and our registered nurse will provide your customized pain-free treatment. THE ACTUAL IV THERAPY TREATMENTS: After you meet with the doctor to discuss you unique IV therapy nutritional drip “cocktail” you will be taken to a spa lounge chair in a relaxing patient care room where our acclaimed registered nurse will insert a “saline lock” (a small catheter) into a vein of your forearm, or sometimes hand. We pride ourselves in trying to provide this service with as little discomfort as possible. Following, IV tubing from a solution bag is connected to the saline lock and fluids are allowed to flow through the system, directly into the venous system. Upon completion, typically around 30 minutes or less, the saline lock is removed and a small-band aid applied. If you have selected booster supplement shots, they may be administered by nurse either before or after the IV infusion. The nurse will then direct and assist your with your check out process. The effects and benefits of your IV therapy infusion will start to be evidenced immediately following treatment. Myers’ Cocktail IV Therapy: Myers’ Cocktail is a mix of vitamins and minerals therapy developed in the 1970’s by John Meyer, M.D., a Baltimore physician at Johns Hopkins University. The cocktail is used for the treatment of a wide range of clinical conditions and to enhance your immune system. This is the original intravenous (IV) therapy solution, which – for many years – has benefited hundreds of thousands of people by infusing nutrients and vitamins that are essential to the body directly into the bloodstream. The great thing about the Myers Cocktail is that it contains levels of vitamins and nutrients that you couldn’t take orally, giving your body the boost it needs sooner rather than later. Executive Stress IV Therapy: This cocktail contains higher doses than the Myers IV cocktail and contains nutrients that are depleted by stress. You will feel energized and improved mental clarity for days afterwards allowing you to re-balance. Hydration IV Therapy (AKA “Hangover Hydration”): This popular IV infusion delivers fluids, vitamins, electrolytes, minerals, and other nutritional supplements directly into your bloodstream to provide relief for a multitude of common ailments associated with the accumulative effects of dehydration including hangovers. Glutathione IV Therapy: Glutathione is a master antioxidant found in every cell in your body. However, Glutathione must be generated within the cell from its precursors before it can work effectively in the body. It is extremely important in all detoxification pathways. The presence of glutathione is required to maintain the normal function of the immune system. Glutathione scavenges free radicals, detoxifies poisons and heavy metals, helps deliver amino acids into the cells, helps in bile production and much, much more. 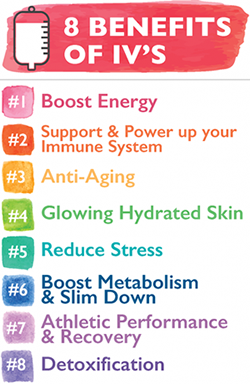 Glutathione is an extremely powerful antioxidant and key to almost all body functions. When glutathione is depleted it results in cell death. When glutathione levels are sufficiently high it protects your cells from damage by free radicals, among other benefits.Above all glutathione is extremely important in maintaining a healthy immune system. Mood Boost: The perfect pick-me-up! Packed with high doses of Vitamin B, minerals and amino acids, this drip also contains essential nutrients and antioxidants, ideal for promoting general well-being. This is also an excellent IV infusion to reduce stress, depression, and anxiety. Weight Loss Boost Nutritional IV Therapy: This cocktail contains high concentrations of B vitamins, vitamins, alpha liponic acid, trace nutrients, and metabolism boosting vitamins. Designed to kick-start your weight loss regime, our weight loss IV therapy cocktails are designed to expedite the process of natural weight loss, maximize the body’s metabolic rate and burn fat. Anti-Aging IV Therapy: This cocktail contains age-defying antioxidants provides protection from UV damage, wrinkles, toxins, and dryness. This infusion is high in Glutathione, a powerful antioxidant, which is fantastic for fighting signs of aging and helps keep your skin looking radiant. It contains a range of nutrients to help rejuvenate and hydrate the skin as well as assisting collagen restoration. High Dose Vitamin C IV Therapy: We need to replenish our water-soluble vitamins such as Vitamins B and C daily. While we can get these vitamins from various fruits and vegetables, many of us do not always consume enough on a daily basis. On top of that, many factors in our environment today deplete our body’s supply. These include smoking, alcohol, caffeine, cooking, eating produce that is not fresh, and particularly stress. Alpha Lipoic Acid IV Therapy: Alpha-lipoic acid is an antioxidant that is made by the body and is found in every cell, where it helps turn glucose into energy. Unlike other antioxidants, which work only in water (such as vitamin C) or fatty tissues (such as vitamin E), alpha-lipoic acid is both fat and water soluble. That means it can work throughout the body. Antioxidants are substances that attack “free radicals”, waste products created when the body turns food into energy. Free radicals cause harmful chemical reactions that can damage cells in the body, making it harder for the body to fight off infections. This antioxidant is known to boost levels of glutathione in our cells. Multi-vitamin IV Therapy: This is a fully customized IV therapy offering that is based on your current health issues and well being. MSM IV Therapy (AKA “The Workout Recovery Infusion”: MSM works as an anti-inflammatory and an antioxidant. This highly valuable nutrient plays an important role in building healthy cells so if you are suffering from low levels of nutritional sulphur, the impact on your body as a whole will be great. The production of hormones, enzymes, antibodies and antioxidants all depend on MSM and it is used and expended by the body constantly, meaning that supplies need to be continually replenished otherwise the body becomes deficient. MSM is a nutritional sulphur that is found in dairy products, fruits and vegetables, grains and meat. Largely due to modern day food processing, many people are found to be deficient in this valuable nutrient which is where intravenous therapy steps in.